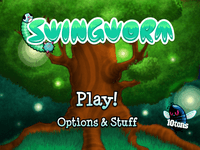 The titular character in Swingworm is a stretchy caterpillar determined to climb the highest tree in Whispering Woods. His dream is to see the Moon with his own eyes from the top of that tree. The adversary in this swinging tale is the sinister Big Bug who claims to own the tree and demands delicious berries as a payment for climbing the tree. Move the Swingworm by grabbing his head or tail and flinging or pulling it as far as his stretchy body allows. Swingworm holds on to surfaces with his teeth and spiked tail and must always remain attached to a surface from either end.